Look like a dream, feel like a lady. Take charge of the situations life gives you. Be proud and let the world know it. 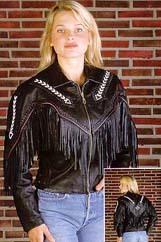 Cultured Cowboy offers this nice quality imported line of clothing. 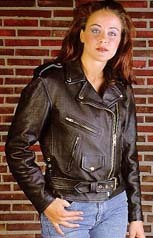 Even though this line has been designed for the motorcycle enthusiast, we have found the collection to wear well in our Western markets as well. Remember, "It's all an attitude anyway!" 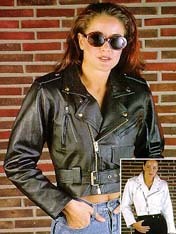 These clothes are affordable, while maintaining the value associated with genuine leather. 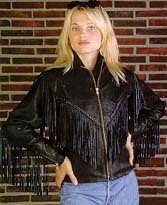 Select buffalo and cowhides are used to manufacture a garment of value. Expect more contrast in the tones of the leather, and more scars in the buffalo, than you would expect on our premium leather lines. Sizes tend to run on the small side of normal with these clothes. If you are between sizes, go up! 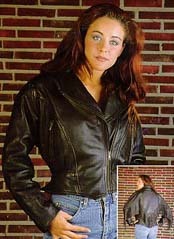 Choose from any of the following Ladies Coats or browse through these other Cultured Cowboy sites of the same quality.